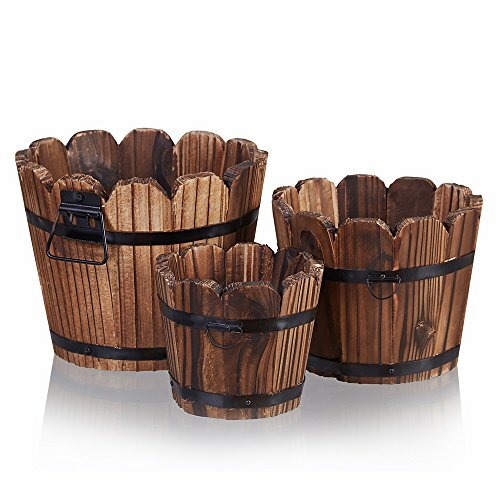 Why Choose HakkaGirl Wood Barrel Planters ? *Wood scar,wood mark or small gap should be allow due to Hand-made with natural wood.These are not quality problems, not affect it beautiful and normal use, but improves the rural style personality. *With the difference in the measurement method, please allow 1-2cm in size deviation. *Please allow a little difference in color due to the screen of display or reflecting light when shooting. -When you bought and received the wood planters, we believe that its rustic design and quality will not disappoint you . -Any question (before or after purchase) pls feel free to contact us, our friendly and helpful customer service centre is always here for you. HIGH QUALITY: These natural wooden buckets is quite thick with the metal straps around flower pots for anyone who wants a unique plant holder. 2 STURDY TWINE HANDLES:2 metal caps on both side make garden barrels easy to move from place to place.Leave handles up to carry and push handle down for storage. EYE-CATCHING RUSTIC DESIGN: Eye-catching vintage and water bucket-shape style Show off your excellent taste. Perfect for home decor, centerpieces, office, wedding, balcony, patio, garden, holiday, other artificial plants and flowers. Very adorable and unique gift for your kids,parents and lovers. MEASUREMENT & REINFORCED PACKAGE: (S): 4.7W*3.5H inches (M): 5.9W*5.1H inches (L): 7.5W*5.9H inchese.Thick dual bubble wrapped with a sturdy Amazon box guarantees these barrel planters arriving in perfect condition, free from the hassles of damages or returning. 100% MONEY-BACK GUARANTEE: Should you be, for whatever reason, dissatisfied with your purchase, you are FREE to return your planters and receive a FULL Refund of your money. If you have any questions about this product by HakkaGirl, contact us by completing and submitting the form below. If you are looking for a specif part number, please include it with your message.